The City of Cape Town is experiencing its worst drought in over a century and if nothing is done the city is likely to run out of water before the rainy season of 2018. This plot of Cape Town's supply over the last five years aims to make that obvious to everyone. If historical usage trends continue, there is not enough water to get Cape Town through the summer. Despite this major crisis, many people in the city are not changing their behavior fast enough. Please help us save water! The easiest way to see trends and how bad the situation is today is by looking at this graph of the dam levels over time. This makes it clear both how severe the situation is and how scary the current drop-off is. The red line represents the estimated point at which the taps will be turned off, a.k.a. "Day Zero". Here are four simple things that everyone in Cape Town can do today to respond to this crisis. Save 10 L of water for every minute shaved off your shower. The city recommends taking 90-second showers. 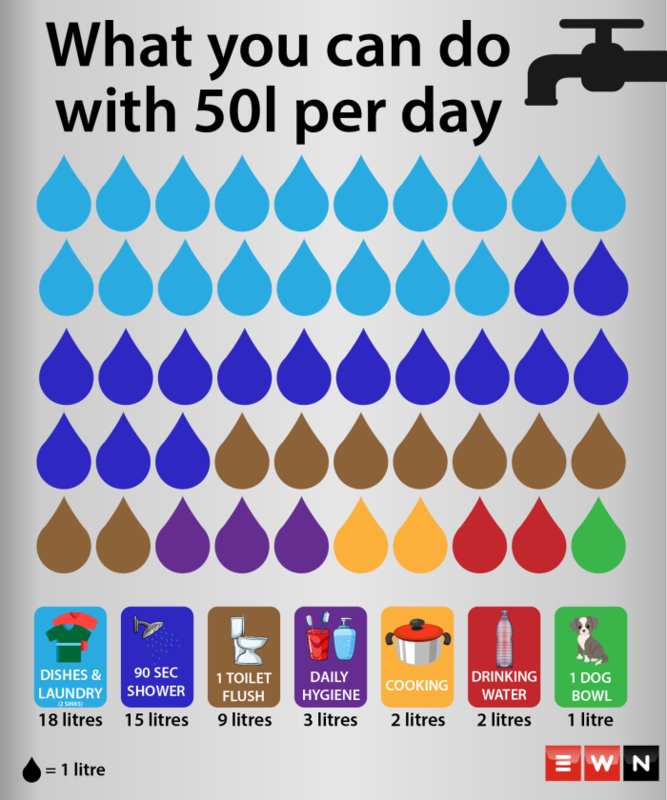 Save 9 L of water every time you choose not to flush your toilet. If it's yellow, let it mellow! Save 8 L of water every day by dropping a brick or full bottle into your toilet cistern to reduce its water consumption. Put a bucket in your shower and sink, and use the run-off to flush toilets. For more information and ideas, check out the Resources below. No was wasted in the creation of this site.